Pow Wow Outfitters IS CLOSED: it was a 1 stop bead supply and craft store. 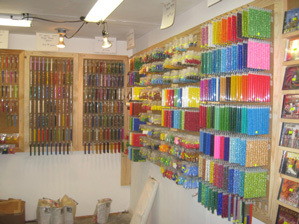 Come see why Pow Wow Outfitters is your one stop bead supply and craft store. Located in the beautiful cultural district of Cherokee North Carolina, Pow Wow Outfitters is Indian owned and operated, a TERO certified craft vendor, and a member of the Indian Arts and Crafts Board of the Department of the Interior who guarantees that all crafts sold in our shop are 100% Indian made. Browse our selection of thousands of beads ranging from size 18/o to 2/o in cut, hex, silver lined transparent, and opaque. 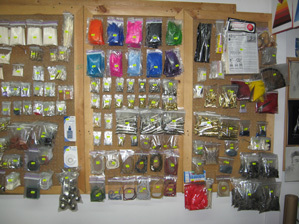 Pow Wow Outfitters of Cherokee also has a large selection of pony beads, crow beads, fire polish and chevrons, or our selection of leather and furs. You are sure to find what you are looking for here to make crafts or to make your championship regalia. Pow Wow Outfitters has Cherokee crafts as well as crafts representing many tribes. We have cedar boxes, jingles, 18th Century reproduction sterling silver jewelry, Conchos, hawk bells, sleigh bells, brass beads, abalone, bone hairpipe, antique trade beads, assorted shells and claws, pow wow music CD's, mirror boards, assorted horse and stock club dance sticks, straight dance scarves, Pendleton blankets, and a wide variety of pow wow dance items covering all styles. 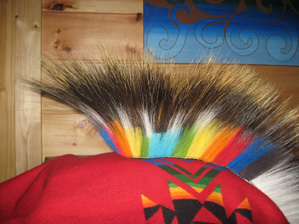 You will also find pheasant, peacock, imitation eagle, redtail black cockatoo, macaw, and marabou feathers as well as colored hackles and fluffs. 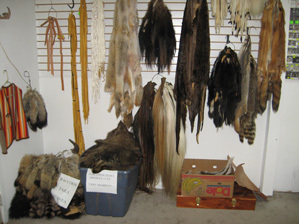 There is also horse hair, porcupine hides, coyote hides and tails, buffalo tails, buffalo hides, buffalo bones, fox hides and tails, otter hides, ermines, badger hides, skunk hides, raccoon hides, wolf hides, assorted antlers (deer, elk, moose), natural and dyed deer tails, rawhide, and natural and dyed porcupine quills at Pow Wow Outfitters. Need something special? Pow Wow Outfitters takes custom orders for beadwork, porcupine quillwork, bustle work, or sewing to bring your vision to reality. We also take custom orders for porcupine roach head pieces. Brad McMillan's roaches are highly sought after by discerning dancers across the country and Canada. You can view these pieces at the Pow Wow Outfitters My Space Page. If you have a passion for Cherokee artwork, Pow Wow Outfitters is the exclusive dealer for Helen Smoker Martin Art. From watercolors to oil paintings, Helen Smoker Martin offers a wide variety of originals as well as prints for the refined collector. Looking for a one of a kind gift? Helen Smoker Martin also does custom portrait work in your medium of choice. You may view these fine pieces at Helen Smoker Martin's Profile on Fine Art America. Call today to make an appointment for your one-on-one collectors' consultation. Are you an artist? We take orders for custom canvases, primed or unprimed. We accept Visa, MasterCard, cash and money orders. Shopping for someone else? Not sure what you need? No problem! We have Gift Certificates too!